SAN FRANCISCO, CA— After securing the rights to a few Broadway shows in 1999, OCESA, Mexico's “Cartelera de Espectàculos” (A production group) decided to introduce in Mexico the American Musical Theatre. After all their books and lyrics were translated to Spanish, the auditions for local talent began. BIANCA MARROQUIN, a young student majoring in communications at the Technology University in Monterey, Mexico, auditioned as a dancer. Since she could also sing, she was selected to play a part in the ensemble of Disneys’ "Beauty and the Beast." After that, she acted minor roles in "Rent" and in "The Phantom of the Opera". By 2001,however, BIANCA was acting a lead role and the media was calling her “A Star.” The role she was playing was “Roxie Hart” in the Mexican production of CHICAGO. Her ingenious interpretation of the satirical role and her way of dancing, caught the eyes of the Broadway producers of the show. She was invited to reprise the role on Broadway with GEORGE HAMILTON playing the role of Billy Flynt, the Lawyer. BIANCA MARROQUIN made her Broadway debut at the Shubert theatre on June 18, 2002 becoming the first Mexican woman, ever, to play a lead role in Broadway. As one the “Special engagements for 2014”. 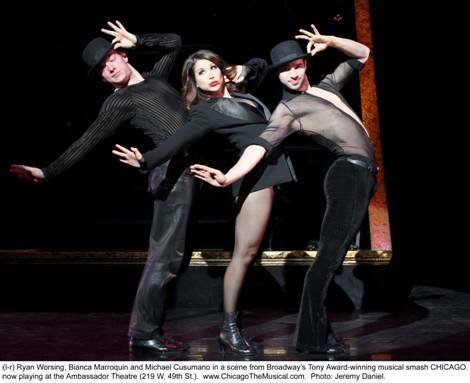 dancer, singer and star of radio and television BIANCA MARROQUIN, will reprise her Roxie in San Francisco in the upcoming SHN production of CHICAGO, a tale of fame and fortune and all that jazz. In a phone interview CULTURAL WORLD BILINGUAL talked with the star. C.W.B. What is Theatre for you? BIANCA: “Theatre is a profession that I could not change for anything. For me, the stage is “Sacred” and I was lucky I set foot on the stage since I was very little. I believe that the “Stage Bug” stung me one day and since then, I developed a great respect and an eternal love for the theatre." C.W.B. How did your career start? B.M: “I started my career as a dancer, and while learning to dance, I acquired respect for the arts, learned discipline, and refined my desire to become better every day. I was born in Nuevo León Monterey (Mexico), but when I was one year old my parents moved to Matamoros, which is in the border of Brownsville, Texas. At the age of three, my mother enrolled me in a ballet school in Texas and one day the academy prepared a “Recital” for the students and invited their parents and their families. It was during that Recital that I discovered how wonderful it was to have an audience. I loved the way my family reacted to my dancing, the flowers I received, and the adulation of the audience. I knew then, that acting in a theatre was what I wanted to do with my life." C.W.B When did you first get acquainted with music? B.M. : “There was a lot of music at home, so I had always heard and liked music. As a kid I began singing, not taking singing lessons, but just singing. There was a piano in my house, so I spent hours playing the piano by ear, even composing music. Also, as a child, if I heard a song, I was able to play it. God had blessed me with a good ear." C.W.B When did you start acting? B.M. "After I graduated from High School in Texas, (which gave me the privilege to learn both English and Spanish) I was planning to go to Spain to study Flamenco dancing, but my father said “no, you are going to the Tecnológico in Monterey (a technical University) like your brothers and study a career in Communication first.” I was on my fifth semester, when I heard that Mexico, was bringing Broadway plays to El Distrito Federal, and that the Broadway producers were in Mexico trying to find their talent. I went to the audition of Disney’s “Beauty and the Beast” in Monterey, and was selected as one of the dancers. So, I told my parents that I was going to go to Mexico City for a year and a half and that when my contract was over I was returning to complete my studies. I was in the dancing ensemble, playing the part of one of the spoons, but I was very happy.”. C.W.B: How did you get the lead in CHICAGO? While playing CHICAGO in Mexico, her portrayal of Roxie landed BIANCA an invitation from the producers to perform the role for three weeks, at the Shubert Theatre on Broadway. She tells us that she continued playing the role in Mexico, singing the songs in Spanish at night, and during the day, rehearsing her dialogue and lyrics in English for her Debut on Broadway. C.W.B. How did you feel? C.W.B. What can you tell us about CHICAGO ? B.M. “ In my opinion, what makes CHICAGO what it is, (the winner of 6 Tony Awards ®, 2 Olivier Awards ® and a Grammy ®) is its book, (written by Librettist FRED EBB and choreographer BOB FOSSE, based on the l926 play by MAURINE DALLAS WATKINS) that is “genial.” That is the reason why the work is still shown after eighteen years, because its production, is “minimalista.” (uses little props) CHICAGO does not have lavish scenography, or fancy costumes and we (the actors) share the stage with the musicians because the orchestra, framed by a golden frame, plays on the stage. But the work succeeds not only because of the music and dancing, but mainly because of its book." C.W.B. As the player of the book's characters, how do you bring Roxie to life? We end our interview asking BIANCA,the first-ever NATIONAL AMBASSADOR of VIVA BROADWAY, (the new audience development recently created by the the Broadway league, in partnership with the Hispanic Community, with the purpose to bridge the world of Broadway with the Latino audiences around the country) how she feels about receiving that new honor. B. M. |I feel good because I began doing this all by myself in Twitter, and on Facebook a long time ago to make Hispanics aware that there was a Broadway. I was alone in this enterprise until one morning when I was invited to have lunch by a group from VIVA BROADWAY and they asked me if I could be their Ambassador." C.W.B. As an Ambassador, what will be your duties? CHICAGO, will play at the Orpheun Theatre in S.F. from November 7 to November 16. to order tickets call 888-746-1799 or order them online at shnsf.com.